VC Performance Epoxy is a two-part Teflon bearing epoxy that has a hard, slick finish ideal for use on the underwater surfaces of high performance powerboats and racing sailboats. Teflon adds lubricity and eases wet sanding and burnishing. VC Performance Epoxy's hard, stain-resistant finish is also ideal for rack-stored and trailered boats or boats that are kept in the water not requiring antifouling protection. 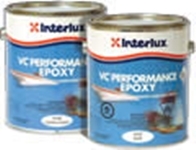 VC Performance Epoxy has no antifouling or foul release properties.